I will be kicking off Jen Rizzo’s Christmas Home Tour which begins December 2nd! Eek! With preparations for Thanksgiving, that doesn’t give me much time to whip the house into Christmas shape. This week, I have been frantically dusting off bins of decorations and crafting up a storm. 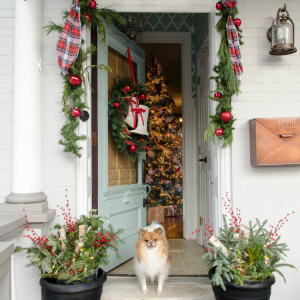 I love seeing the Christmas home tour posts, but I also find them a bit overwhelming with so many photo. 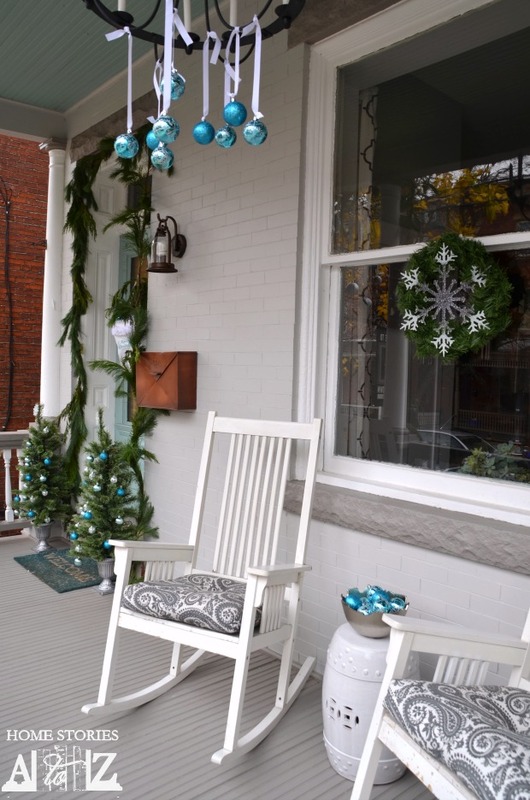 So, I thought I’d give you a sneak peek of what is to come by showing off my newly decorated Christmas porch. We live in a city “twin” and this past summer had the exterior of our home repainted in Sherwin Williams Knitting Needles, Dovetail Gray, and Rainwashed. I am smitten with how fresh and different it looks. This is my first time decorating the porch since it’s been painted. 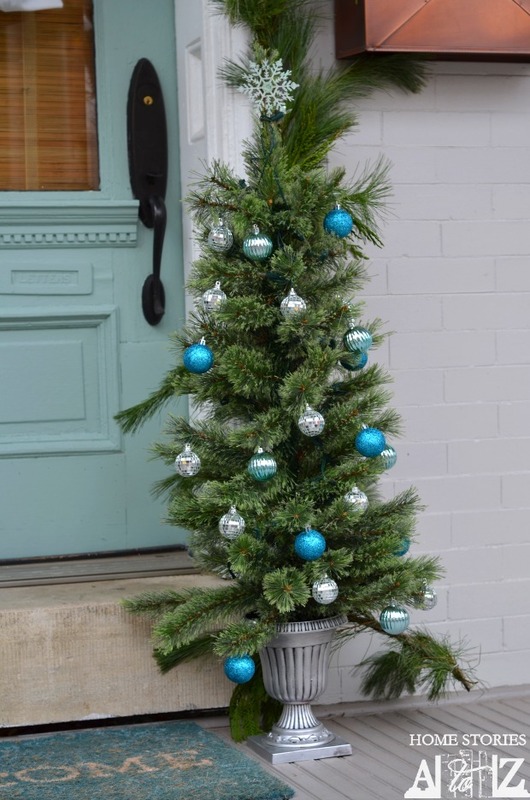 I love my blue ceiling and door and wanted to keep within the color palette so chose ornaments in sparkly shades of blue. I found these two trees at Big Lots and didn’t like the brassy sheen of the urns. 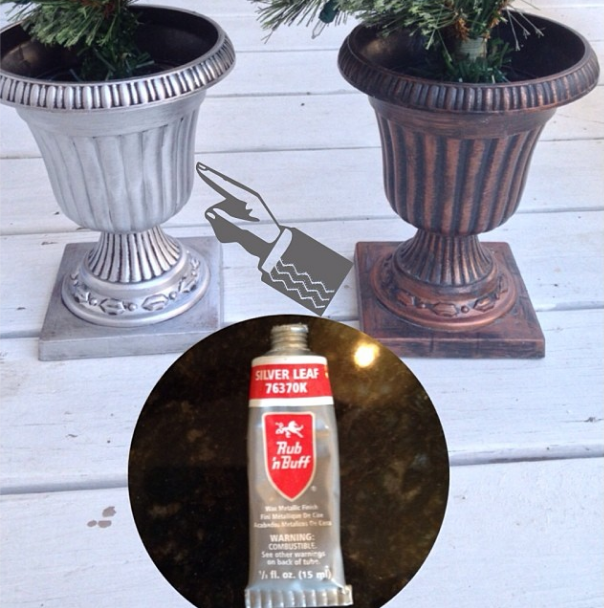 With a tiny bit of Rub n’ Buff in Silver Leaf and a paper towel, I was able to transform the metal to silver in a matter of minutes without the hassle of painting. These trees are pre-lit and look very pretty at night. They add just the touch of glam that I desired by the door. I kept the decorating out here very simple and non-fussy. 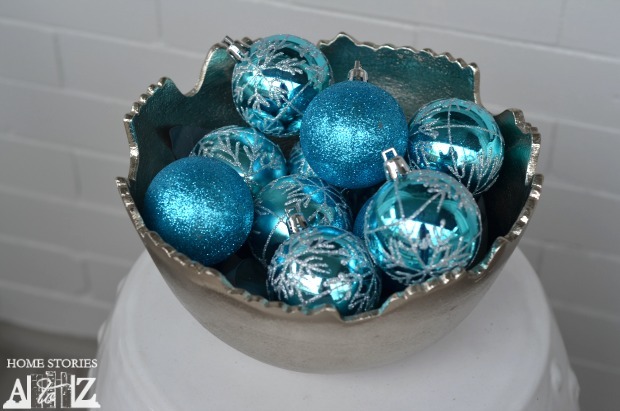 A bowl or sparkly blue ornaments sits between the rocking chairs in a pretty silver bowl. I wanted to try something different for the front door other than a traditional wreath. I took an old pillow case, a garland, some fur trim, a few wrapped boxes, and ornaments and created a “Santa Bag” for the door. I think it’s adorable and something completely different which is what I wanted. The ornaments hanging between the columns are attached to a bundle of sticks which are hung from a few nails. Sometimes you have to get incredibly creative in figuring out how to hang Christmas decor. And here is a full shot of the exterior of the house since I know a few of you requested to see how it turned out. I plan on placing wreaths in all of the windows on the top two levels so just pretend they are already there :). 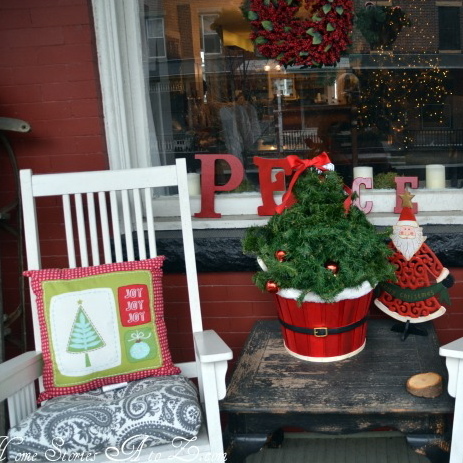 Thanks for stopping by to see my Christmas porch! I’m excited to show you a few other sneak peeks of my Christmas decorating progress before the big house tour on the 2nd. Hi Beth I love your porch! I want to feature a pic of it tomorrow on my Pinterest pics of the week post if that’s ok. No worries I always link back. If it’s not ok please let me know! Gorgeous Beth! The blue really suits the lovely new porch paint colours. Love this!! 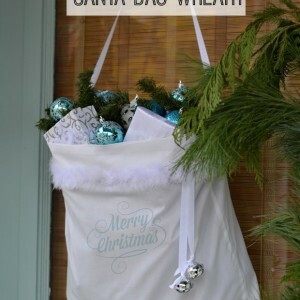 The Santa bag on the front door is adorable!! So unique too! So Adorable. 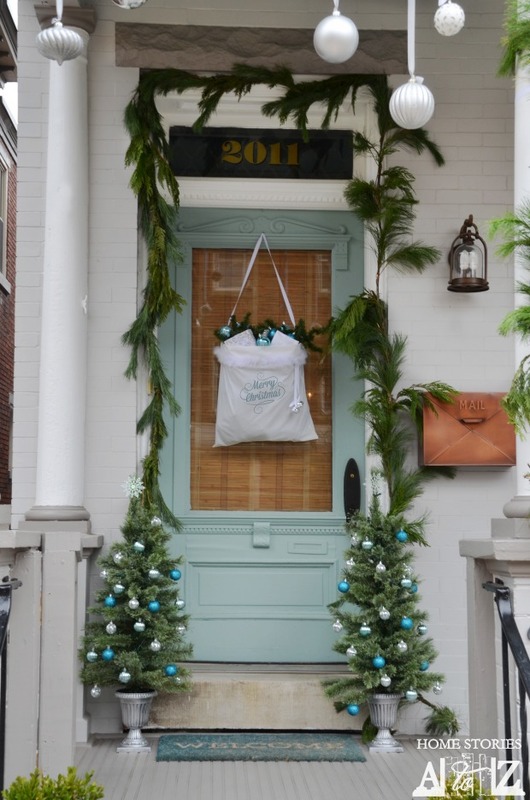 I just love the entire thing…the color scheme, the bag of gifts on the door…just all so sweet. Great job. I love the Santa bag! the porch looks amazing!! So pretty and I love the blues 🙂 I am doing some blue as well this year and it’s so fun! Beth! I love your painted brick exterior!! So pretty!! 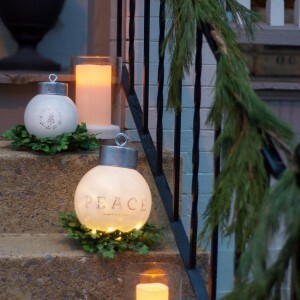 Beth, your porch is so pretty!! I love the colors you chose – they go so well with your new paint colors. I’m like everyone else…the Santa bag is SUPER cute. Did you use your Silhouette to make the “Merry Christmas” across it? If so, all the more reason for me to enter the giveaway!! One last question…(sorry if you’ve already answered this on your blog) Where did you get your garland? It looks so real, and I have wanted to get something similar for years. Thanks so much for the beautiful inspiration!! Oh yes, a Silhouette is a must when you want to do a stencil for word art so I hope you win one too! 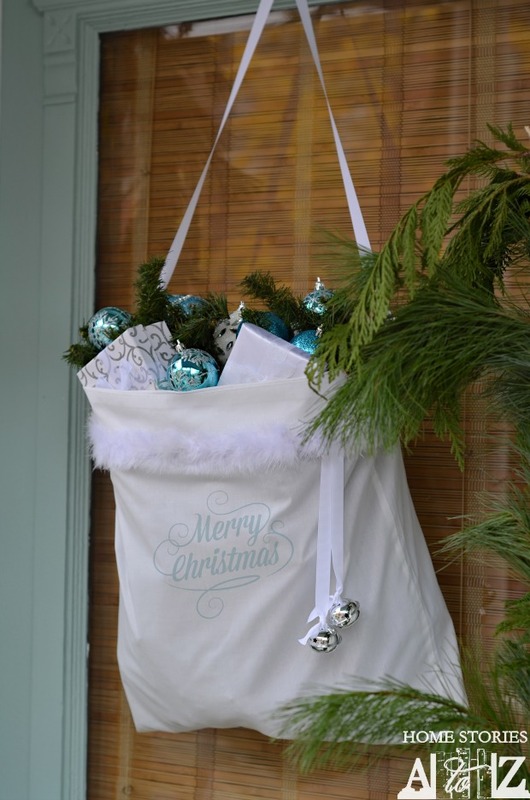 The Merry Christmas font/graphic on the bag is one I found on PicMonkey. The garlands are all real. You can purchase real garlands from Lowes or Home Depot for around $12 per 20 feet. I actually used 3 garlands on my porch so it was more money than I typically spend but I had a gift card so didn’t feel too bad about it :). 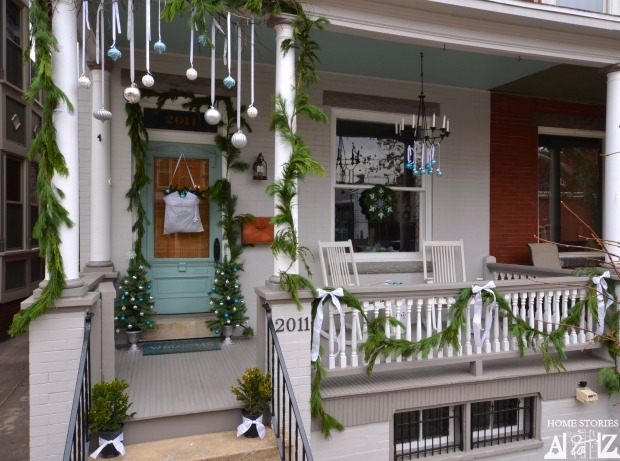 I always love your porch…it turned out beautiful this year! Thanks so much Brandi! So far they have just looked at me like I’m insane for decorating before Thanksgiving :). Or maybe it’s because I was on a ladder in the street taking these shots. Ha! LOVE IT! I use similar colors, blues/teal/aqua and silver/white. This year I am adding orange and bright green. It will be the first time I’ll be using a ‘traditional’ Christmas color of green – though I am going bright so’s not to be too traditional!!! LOVE the colors of your house as well. I have dark gray and blue – also SW. Here in Colorado, I can’t hang glass ornaments outside like you did though I like the idea – just too windy here! I may look for plastic ones. 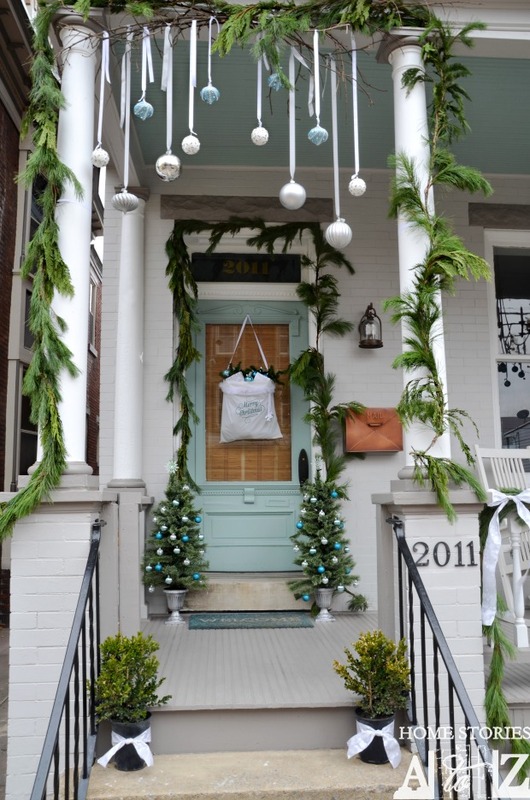 I also like the front door idea, I too don’t like the traditional wreath on a door. Usually I do a plate between the front and storm door or a mirror with some holly and pine. Orange and bright green sound fun Victoria! The ornaments are all plastic and foam so they should be okay but I have no idea if they’ll last or not. We are supposed to have high winds this weekend so fingers-crossed that they make it. Thanks for stopping by and leaving a sweet comment. 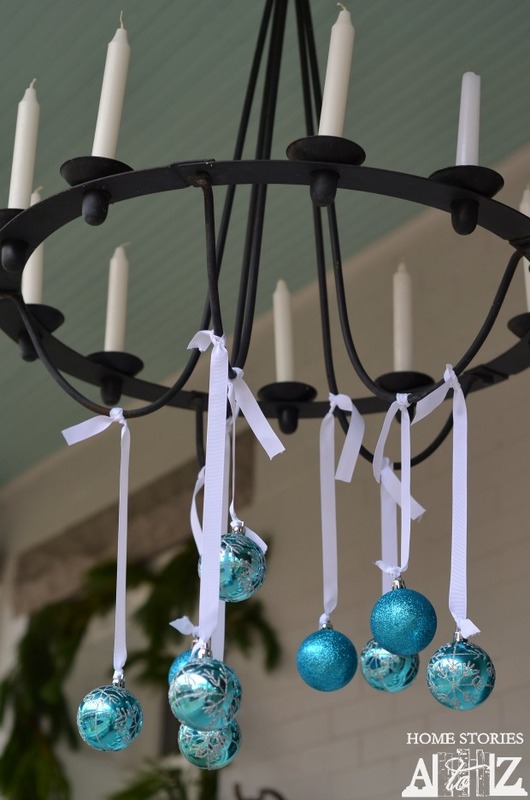 I love the blue ornaments, they look great with your new paint colors. So fresh! Love the whole thing, especially that Santa bag, but I am positively swooning over your mailbox! That is gorgeous! Wow!! This is positively beautiful. You are so creative. 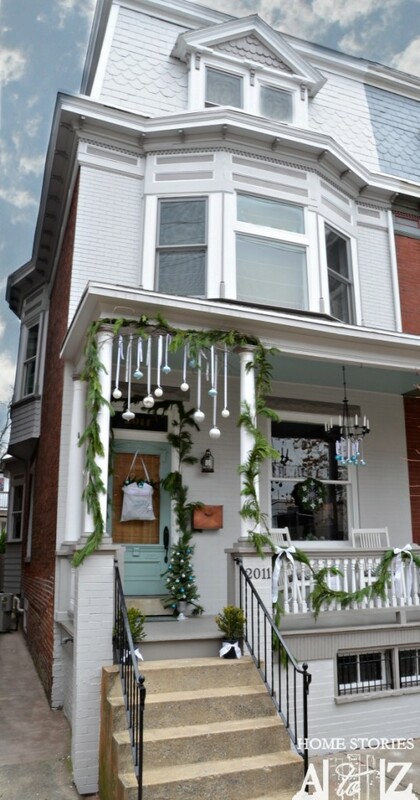 I am showering you with praise as I love it all, especially the Santa’s bag hanging on the door. I can’t wait for the rest of your home tour. I’m a new blogger and all I’ve been doing is decorating for the past week. I haven’t even thought of my front porch yet so be happy with all that you’ve accomplished. Thanks so much Dana and welcome to home blogging! Thanks Kerri! And yes, we have “strong winds” in the forecast for this weekend so we’ll see if the ornaments make it or not. They are all plastic and foam but they might be blown to bits as well :).